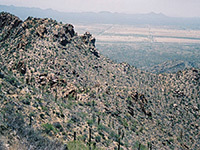 The 4.9 mile Hugh Norris Trail to 4,687 foot Wasson Peak, the highest point in the Tucson Mountains district of Saguaro National Park, climbs steadily through the saguaro forest to more open, rockier terrain near the summit, gaining 2,130 feet in elevation and affording immense views across 80 miles of the Sonoran Desert. The scenery is especially unspoilt and pristine, the path is well maintained and not too difficult - with only two particularly steep sections, at the beginning and near the end - making this the best trail in the west section of the park, though as with all long paths hereabouts the hike is best avoided during the hot midsummer months, when temperatures in the foothills can exceed 110°F. En route are countless saguaros of every age, shape, condition and aspect, together with opuntia, cholla, barrel cacti, echinocereus and other desert plants. Topographic map of the Hugh Norris Trail. The path is named after Hugh Norris, a former police officer for the Tohono O'odham Indians. The trailhead is 0.8 miles along Hohokam Road, which forms the south side of the Bajada Loop Drive, meeting Kinney Road 1.5 miles northwest of the Red Hills visitor center. Beside the road is a small parking area, enough for maybe four vehicles, and a trail register. The path sets off into the desert, round a hill and into a narrow ravine, then follows alongside the dry, sandy wash, climbing quite steeply via switchbacks and steps cut into the rock, to the top of a ridge where the views open out to include much land to the east. The ridgetop has clean, stony surroundings, like parts of Joshua Tree National Park in California, with clumps of granitic boulders sitting on a surface of coarse sand, dotted with saguaro, ocotillo, cholla and palo verde at orderly intervals. The gradient becomes less steep as the path follows the ridge eastwards, the ascent still aided by countless steps built out of the local rock, making the journey like climbing a never-ending staircase. The route stays close to the top of the ridge, mostly just on the north side. It passes over a minor summit made of larger rounded boulders, descends on the far side, then alternates between some straight, level sections and short sets of switchbacks. The surface is fine in general, though slippery on some of the slopes where loose gravel lies on top of stone. Views of the surrounding plains and distant mountains are impressive from the start and become ever more far reaching. After 2.7 miles, near some fenced-off old mine shafts, the Hugh Norris Trail reaches a junction with the Sendero Esperanza Trail on a saddle between higher ground; left (north) is 1.7 miles to the Golden Gate Road while right (south) reaches the King Canyon Trail after 1.4 miles - see hiking index. 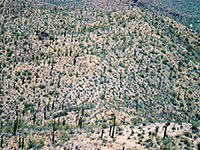 The main path continues its ascent eastwards, following the north side of the ridge, and soon passes 4,000 feet, where the saguaro are fewer and the vegetation generally sparser, though the cacti are more abundant when the trail crosses over to the warmer, south-facing side of the ridge (below Amole Peak). Not far beyond, the path begins a steeper climb to a rocky intermediate summit, where it meets the King Canyon Trail that provides an alternative (and shorter) route to Wasson Peak starting from the main road, just south of the park boundary. 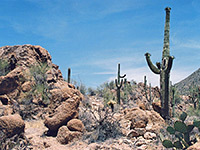 Some plants of the chaparral zone are found here, such as yucca, mesquite and tall grasses. The final 0.3 miles to the peak is along another ridge, passing a second trail register near the end, and finishing right atop the barren summit. All of Tucson is laid out to the east, with the Santa Catalina and Rincon Mountains rising beyond, up to 40 miles away. In the other direction, the views extend 30 miles to the Silver Bell, Waterman and Roskruge Mountains - see 360 degree panorama. The register suggests that only 1 or 2 groups complete the trip on a typical day, taking between 2 and 4 hours to make the climb.